Emile's have been in Putney for over twenty years and is a much loved haunt according to members views on the forum. The menu is changed on a monthly basis retaining popular favourites such as the signature dish the "Beef Welly".
" The traditional methods of breeding, rearing and finishing livestock used in our grandfather’s day are still evident in Charles’s protocols. The combination of outdoor rearing and the breeds is quite simply incredible taste - ‘the proof is in the pudding’ as they say." "2009 was our greatest year yet - we pride ourselves on offering great food in a relaxed atmosphere where customers quickly become friends. We are always looking to improve our menus and our customers dining experience. Rare breeds offer greater flavour but I should mention that the hanging of the meat is very important in achieving this." "True provenance is important and we can guarantee this with our menu". "The Longhorn steaks on the menu this month brings a taste of what is long gone. 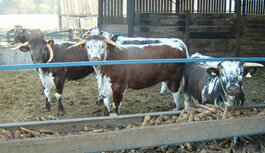 We aim to provide the opportunity to try these great meats at an affordable price". Char Grilled Sirloin Steak - (30 Day Aged Longhorn Beef), served with bèarnaise or red wine sauce, chips & a rocket salad is on the menu for October and if you book a table this month Monday - Thursday evenings mention PutneySW15.com and get a free glass of Kir from Emil and his team.